Race updates, training insights, and notes about the adventures along the way. High school senior Caitrin Huysman shares her experiences from Ellen Noble’s CX Quest training camp in Tucson, AZ. Smiles for miles! Caitrin (center of the photo) getting some good time in the saddle In Tucson, AZ. INTRO: This year I had the opportunity to go to Tucson, Arizona for Ellen Noble’s Cyclocross Quest. The training camp was 7 days of base miles on the road. With long and consecutive days on the bike, we focused on proper nutrition, stretching, core work, and good recovery practices. Ellen and the other coaches, Molly Hurford and Peter Glassford, also helped us with goal setting, race preparation, and topics relevant both on and off the bike. Living and riding with 11 other young women for the week was an amazing experience! Even though we all are from across the United States and Canada and race different disciplines, by the end of the week we were really close and a strong group on the road. A MOUNTAIN: We climbed “A” mountain (AKA Sentinel Peak) on a slightly rainy Tuesday. The climb wasn’t very long, but it was way different than anything we have at home in CT. Descending was a little sketchy with water on the road, but as a group we had already descended Gates Pass a few times so I felt pretty confident following my fellow campers’ wheels. I focused a lot on proper nutrition during my rides this week. Coach Steve introduced me to proper nutrient timing and quantity in our work before camp, so I was prepared. Eating before I felt hungry or tired took some getting used to, but with the longer rides and more climbing, the focus on nutrition made me feel so much better! I ate mostly bars and Clif Bloks, but Ellen also introduced us to homemade rice bars. At first I wasn’t sure how cold rice from a jersey pocket would be but after trying them I realized they aren’t bad! Made with sticky rice, the bars had different flavor combinations every day. My favorites were coconut chocolate or peanut butter banana. MERCADO RIDE: Between our ride up A and Mt Lemmon, we took a bit of an easier day. After a windy out and back route, we stopped at the Mercado to get food. The Mercado is a really cool square with a Mexican restaurant, coffee shop, bakery and a few other stores surrounding it. While 65 cent donuts and lattes were good, one of the best parts of stopping was running into Maghalie Rochette. I was able to introduce myself and talk about the delicious pastries and amazing riding in Tucson with her. 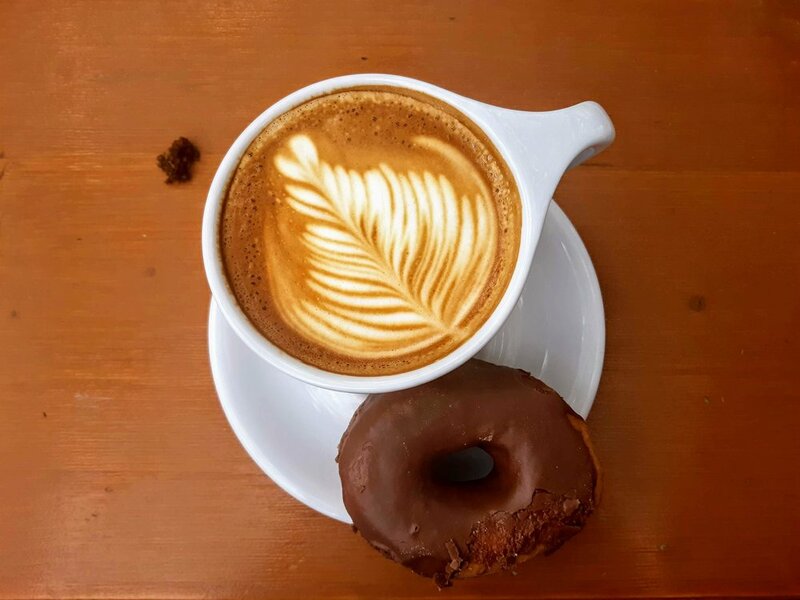 Luckily the ride back to the house only took a few minutes; after downing a donut, two pastries and a latte I wasn’t sure that my body was up to going very fast or long! Riding into the headwind this day gave us a lot of practice doing rotating pacelines. I don’t often ride in groups on the road, so doing this throughout the week was new to me. With everyone pulling for short periods and working together the long straight sections were bearable and didn’t feel to bad. 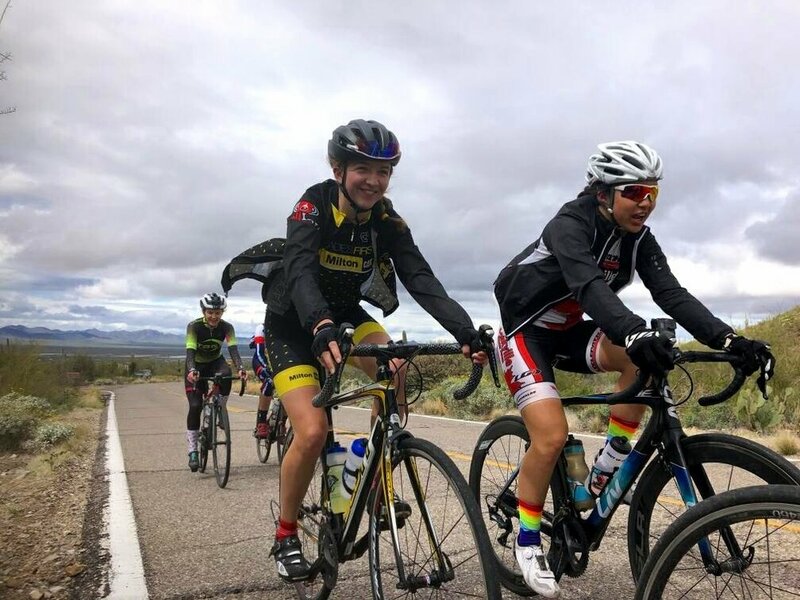 MOUNT LEMMON: The queen stage of the week was climbing Lemmon on Thursday. I was feeling my legs when we began the climb, so I was nervous that I would cramp up or something. 25 miles of climbing was more than I’ve ever done, but the views and change in climate distracted a lot from the fact the climb just kept going. We spread out, all riding at our own pace. I was sometimes between groups, but for the most part I was with other girls which was motivating. I started in short sleeves and bibs, but by the time we were at the top I was in arm and leg warmers, a jacket, full gloves, and two pairs of socks. The Cookie Cabin was open (thankfully!) so we all got food (aka cookies and some hotdogs) and warm drinks before descending. Lemmon is a ride I could do every week and still be in awe with the landscape. LAST DAY: The last day was when my legs and about everything else were the most “spicy”. Throughout the week we didn’t use the word “hurt” or “tired” but instead terms like spicy to describe how we were feeling. It is a lot easier to mentally tell yourself that your legs are just a little spicy rather than tired! If I was riding at home by myself I probably would have stopped sooner, but the group and supportive environment made it way easier to finish the last 2.5 hours of riding. Besides a few flats and me tipping over when we stopped at one point (I’m still not used to road pedals), the week went really smoothly. It was my first experience with a block of base miles when I didn’t have to juggle school and work, and it couldn’t have gone better! I’m excited to use what we learned at the Quest in my day-to-day life and to get the most out of my training and recovery. Bell Lap Athlete, Carlo Quicho (Green Line Velo), writes in after some exciting race days in British Columbia. The last couple weeks of racing have been a huge learning curve for me, but also a chance to really give racing my best and to have some fun. My visit home to Vancouver, British Columbia coincided with a premier road racing omnium, BC Superweek, bringing stacked fields from across the world. The big players at these races were: the American Rally Cycling and Hincapie Racing teams; Canadian Silber Pro Cycling and H&R Block Pro Cycling teams; and, the German Hermann Radteam. The courses were tight and technical, and would have been tough with 50 guys… except most of the races started with no-less-than 130. I recently upgraded into the Cat 2’s after a successful Killington Stage Race where I landed 4th in the GC, so stepping up to this level of competition was a big jump for me. For the first couple days I was eating my stem and just fighting to survive—but as the week went on I started to become craftier, notice the flow of things and find the right wheels to follow. Carlo sitting second wheel as the race heats up. Each race had such a great spectator presence, it was amazing just to be there. Thousands of curious and passionate Vancouverites lined the course at the Gastown Grandprix— a beautiful criterium course with chicanes, acute corners, and cobblestones - during which the field was absolute chaos, with battles for position in the shredded peloton single-file for huge chunks of the race. I was definitely in a little over my head at these BC Superweek races but I learned so many things being pushed to the absolute limit. I can’t wait to see how I manage these races in a year’s time when I have a little bit more experience under my belt. Working with my Bell Lap Coach, Steve, has really helped with keeping me motivated and fresh throughout this long season, starting with collegiate racing in mid March. The improvements both from a physical standpoint and a racing one have always been steady and manageable. Next up, is the Intelligentsia Cup Omnium in and around Chicago, IL—10 days straight of fast racing!